Today for Food Truck Friday, I’ll be talking about Sloppi Jo’s. Jo specializes in dishes with green hatch chiles. Her food has a mexican feel, but she definitely puts her own spin on her dishes! I first tried Sloppi Jo’s at Vegas StrEats in April. She occasionally offers a fried mac n cheese stuffed with pulled pork in her Christmas sauce, which is a mixture of a red sauce and the green hatch chiles sauce. It was sooo yummy!! I wish I had taken a picture of it, but I wasn’t blogging yet so I miss out on that. I also tried one of their awesome cupcakes. I had the tres leche cupcake that was so GOOD! Since then I try to find Sloppi Jo’s whenever I can. My work schedule has been preventing this, but in the last couple months I have been able to try them twice. 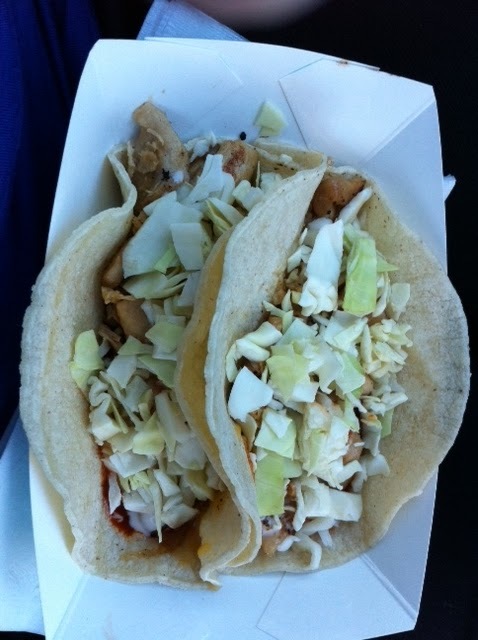 Above is the chicken tacos I tried a couple weeks ago. So yummy! normally I don’t like cabbage or lettuce in my tacos, but I decided to go with it and it actually was really good. I normally can’t handle spicy food, and this helped cut the spicy down. It was perfect! and it was so good I wasn’t paying attention and got sauce all over my pants (and had to go back to work afterwards). I’ve also tried her pork tacos, they were my FAVORITE! Probably because I just love pork, but hey that’s just me! She also has breakfast cupcakes that have maple cake with bacon, maple butter cream, candied bacon, and maple syrup. I had it for breakfast the next day and it was YUMMY! You can check out the menu for Sloppi Jo’s here. You can also see her schedule here. Definitely go check her out!! You won’t regret it! I wish I had taken more pictures for you to see her stuff, but you’ll just have to see it in person yourself! !